Dream Unlimited has been a public company for less than five years, but its roots go back nearly 30 years to the 1989 founding of its subsidiary Dream Asset Management. Dream Unlimited is a land owner, land developer, asset manager and builder of housing, condominiums and retail destinations. Dream is led by 56-year old Michael Cooper – a charismatic, energetic visionary who is the company’s biggest shareholder and a 30-year veteran of global real estate markets. A protégé of investment magnate Ned Goodman, Michael Cooper consolidated his real estate empire into Dream where he wields ultimate authority and oversees a team of bright and motivated colleagues. Customers and competitors speak highly of Mr. Cooper. Some investors are understandably put off by the dual-class share structure, seeing an unfair distribution of ownership. We are willing to accept the share structure since our partner in the common shares has such a long track record of creating value. Dream develops land in Saskatoon, Regina, Calgary and Edmonton. Land development entails converting raw land to the stage where homes and commercial property can be built. Dream owns enough land to develop for 25 years. These are affordable cities and will make excellent homes for many new Canadians in the years to come. If you have any doubt about the long-term demand for housing in these cities – just look at the state of the world outside of Canada. People will be moving to Canada in droves and the Prairie cities are vibrant, growing and peaceful. In February 2016, Dream sold 172 acres of land to the Province of Alberta for $40m. They originally purchased the land 20 years ago for about $3.3m. That’s a compound annual return of about 13%. Dream’s housing development business currently operates in Saskatoon and Regina and just recently expanded to Calgary. The condominium development business has operations mainly in Toronto. Dream’s asset management and management services business provides services to four publicly-traded trusts (including three real estate investment trusts). The trusts pay Dream a management fee and also an acquisition fee when the Dream team buys property for the trust. Dream also owns some of each trust, providing a good alignment of incentives and the opportunity for Dream to make money in two different ways (management fees and dividends). Investment properties are retail and commercial properties like the Distillery District in Toronto and a ski hill in Colorado. Dream also develops retail properties in the communities they create. As you can see, Dream operates in a variety of businesses. 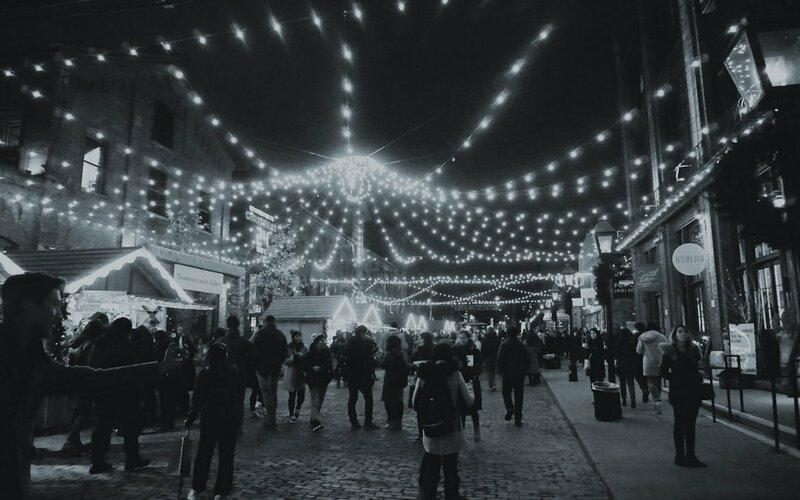 Our process at the Investment Partners Fund is to project earnings into the future and apply a multiple on those earnings to arrive at a target price and annualized return target. This allows us to quantify the magnitude of the potential opportunity and rank the attractiveness of multiple opportunities. But in the case of Dream, the timing of future cash flows is uncertain so we prefer to forecast total cash flows over a long time period and estimate the potential impact on book value. We know that since going public in 2013, Dream has generated $476m of net income, never lost money in any fiscal quarter and increased its tangible book value per share by 100%. The company has historically traded above book value but we prefer to be conservative and assume that market value will equal book value. So the question is – can we demonstrate sufficient net income potential to justify an increase in book value? The chart below shows Dream’s historical lot sales and associated margins. Given the company has about 88,000 lots to sell and assuming margins demonstrated above are maintained, we can estimate net operating earnings to be approximately $4bn over the next 25 years. If we annualize the steady-state operating earnings projected by the company for each of the divisions described above, we can estimate another $2bn of net earnings over the next 25 years. So we have visibility towards $6bn of earnings over the next 25 years. 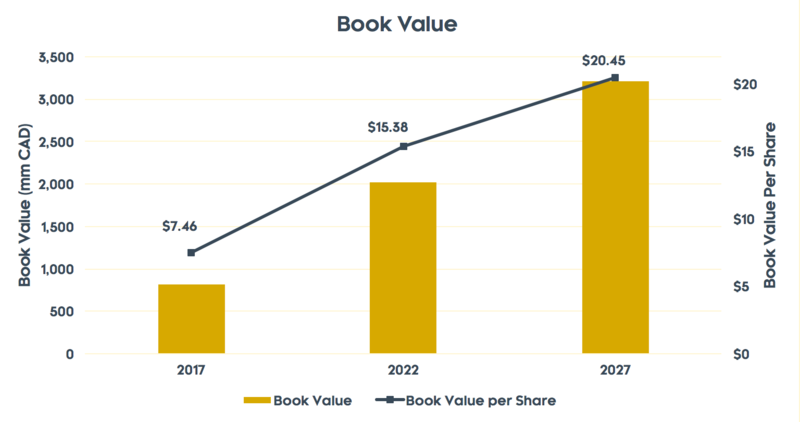 The company has historically translated $566m of net earnings into a $530m increase in tangible book value (100% increase in book value per share) over the past 4 years. The chart below shows a simulated scenario where the $6bn of forecasted net earnings is divided equally over five year periods and corresponds to a similar increase in book value. We expand shares outstanding by 20% in each five year period, to be conservative. Averaging runs rampant though our assumptions – but this is acceptable if you have a long time horizon. The result indicates that Dream could double its book value per share over the next five years and nearly triple its book value over 10 years. While we are uncertain of the exact timing of the cash flows from Dream over the next 10 years, we are confident in the ability of the company and its management to deliver earnings to shareholders over time.